As always, TETH’s standard disclaimer applies. I do not deny Washer or Conway’s sincerity or profession of faith, nor do I believe that one holding their beliefs is of necessity a hell-bound unregenerate. 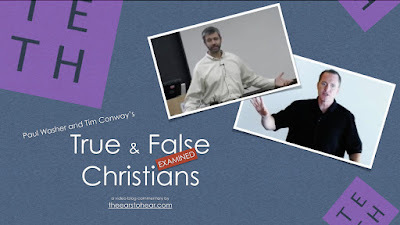 Neither would I assert that Washer and Conway get everything wrong – they do make a number of good affirmations in their teaching from time to time, as we shall see. But I do believe that they stand in need of correction on some doctrinal matters and I believe it is profitable for us to convert brothers in Christ who err from the truth, and in so doing hide a multitude of sins and save them from the death that attends a brother’s state of error. (James 5:19-20) So with that by way of introduction, I give you Washer and Conway on “True and False Christians” along with my commentary. In all candor, it has proven to be a fairly effective means of adding to the ranks of Lordship Salvationists over the past two or three decades. But the larger question remains: is their short-sighted, unsystematic, “plain meaning” interpretation of the apostle John actually the correct interpretation of scripture? We should start by recognizing that ALL regenerate people maintain some measure of love for the world throughout the remainder of their natural lives. This is an indisputable corollary of the fact of remaining sin that so easily besets us in this lifetime (I John 1:8). Indeed if the regenerate were totally devoid of love for the world then there would remain absolutely no motivation for sin nor would sin so easily beset us (Hebrews 12:1). That is an important observation that must shape our understanding of what is meant by John’s statement regarding love for the world. At a minimum it proves that what Conway implies by the “plain meaning” of I John 2:15 is false. To state that more clearly, the apostle John most certainly does NOT mean that regenerate people NEVER have any love for the world during their lives. That is an incredibly important systematic observation, apart from which one has radically misunderstood and misapplied the apostle’s statement. Let’s see what Washer has to say. Well, it’s certainly hard to argue with Washer on that point. I believe it is indisputable that the garden variety evangelical in America is embarrassingly ignorant of the bible. Herein lies one of the dangers of the Lordship Salvationists, IMO. They make a lot of very valid observations about the lackadaisical state of visible Christianity in our time. But it is important to recognize that identifying an evident defect is not the same as correctly identifying either cause or cure. Let’s keep listening. Well it’s certainly true that humanity is broken, and that there is a clichéd form of Christianity that is very popular in American society. The matter of America being the most difficult place to follow Jesus Christ, while admittedly anecdotal, seems pretty well ludicrous in light of the many places on earth where practicing one’s faith could result in persecution unto death. Nevertheless, I’m often inclined to agree with Washer’s descriptions of spiritual malaise in America, if not his insistence that this constitutes =ironclad proof of rampant unregeneracy among professing Christians. Brother Conway, do you sin? If you sin are you not following the course of the world? Is your sin not, in some sense, motivated by a love for the world that trumps your desire and commitment to serve God? If you are following the course of the world when you sin, and it is absolutely undeniable that you are, then you must possess some measure of love for the things of this world. That observation makes it clear that either brother Conway is a hell-bound, unregenerate, or that the apostle John’s statement is far less “absolute” than Conway would have you believe. Simply put, John is most certainly NOT saying that if someone exhibits some love for this world they are unregenerate. Not at all. Indeed if he WAS saying this, then he would likewise be either affirming the sinless perfection of the regenerate, or affirming that all men are unregenerate. So we see that we must be very careful to deal with the apostle John’s statement systematically, allowing the full testimony of scripture to shape a proper understanding of what John intends and in so doing resist the urge to embrace hasty, systematically myopic plain-meaningism, and, worse still to press that wrongly divided nonsense upon the Lord’s sheep. To draw that out more clearly, any proper interpretation of I John 2:15 must also incorporate the testimony of Romans 7:15-23, Hebrews 12:1, I John 1:8, and Matthew 16:21-23. The exercise of reconciling those statements and shaping our understanding of them is right division and it proves that Conway’s “plain meaning” implication is false. Conway uses this example of someone being hit by an 18-wheeler as an analogy for regeneration, even as Washer often has as well. But it is readily evident to any sober reading of the bible that regeneration does NOT alter a man to this degree. A man hit by an 18 wheeler would be physically obliterated. It’s fair to say that his physical appearance would be so radically altered that one would need to examine the contents of his wallet in order to make a positive identification. This does not remotely resemble the change wrought by regeneration as evidenced by MANY, MANY examples in the bible wherein the saints of God lived in ways that were very inconsistent with obedience to God. While regeneration does impart a new nature, one with holy and godly inclinations, it does NOT eradicate the old nature. Stated another way, so long as the old man continues to hang around as a result of remaining sin, the man who has been hit by the 18 wheeler of regeneration may look a whole lot like his unregenerate counterpart. David was a regenerate man but his willful actions with respect to Uriah and his wife look an awful lot like a man who loves the world more than the Lord. He had undeniably been struck by the big-rig of the new birth, but his heinous actions made him appear no worse for the wear nonetheless. Simply put, David looked just like the world in how he was behaving – arguably worse given that he knew better, unlike the unregenerate Philistines he often opposed. Well, it’s certainly true that regeneration imparts a new nature unto men, which the bible refers to as “the new man.”(Ephesians 4:24) But this new nature does not absolutely dominate the man’s behavior to the extent that Washer and Conway insist. One need only mention Solomon, Samson, and Lot to prove that this is true beyond reasonable dispute. So I believe these brothers err in that they overstate the effects of regeneration in a way that cannot be reconciled with the testimony of regenerate saints in the bible, which is a clear indication that they are dead wrong on the issue. To the extent that they exhort men to good works in keeping with their regenerate state I applaud their efforts, but when they imply that the new birth so assuredly or frequently dominates man’s actions as to make rampant and persistent acts of heinous sin an impossibility, they are setting forth an unscriptural definition of the regenerate state that does a disservice to God’s people as well as to the bible’s testimony regarding the saints of God. Of course I believe a great deal of this is based on their gospel-means position with respect to regeneration. They honestly believe that if their preaching is not shocking and confrontational enough, it will fall short of achieving regenerative power. I don’t doubt that such people exist. But I’m made uncomfortable by the implication that a Christian has NO LOVE for the world that remains in his old nature. Indeed, is not the fact that John warns against love for the world and idolatry a clear indication that God’s regenerate people struggle with these things and must be on guard against them? That point bears repeating – the FACT that John warns God’s people against love for the world and idolatry is proof positive that God’s regenerate people are totally capable of loving the world and idolatry. Washer's Defines "Christian" as "Regenerate"
This is all true, but it is not the whole story. A regenerate man possesses divided affections in the form of the new man and the old man. Regeneration does not eradicate his desire for sinful things. Rather, it imparts to him an understanding that those things are evil and a desire to follow God. Regenerate men are creatures of conflict and they will experience spiritual warfare between the old and new man for the remainder of their days on this earth. That is the whole point of Paul’s testimony in Romans 7. It probably bears mention that I have heard Conway teach that the “man of Romans 7” is Paul speaking of himself as an unregenerate man prior to becoming a Christian. One wonders how an unregenerate man, who has no thought of God (Psalm 10:4) and who believes the things of the spirit of God are foolishness (I Corinthians 2:14) would have such a struggle in his conscience or a desire to do good. Conway’s unstable interpretation has become increasingly popular among the Lordship Salvationists over the years, no doubt because to admit that the man of Romans 7 is regenerate would completely undermine their unscriptural assertions regarding the behavior of the regenerate. But I digress. Getting back to Washer. It’s certainly true that regenerate men have a desire to obey God and that the Lord’s yoke is easy and the burden is light, however, this does NOT mean that we do not continue to have an old nature that inclines us to commit sin, nor does it mean that sin does not easily beset us. We find that the yoke is easy and light to the extent that we walk in obedience to God and begin to reap the manifold benefits that come from walking with the Lord rather than piling up the consequences of sin in our lives. Again, while I would not deny that regeneration imparts new affections to a child of God, it does not mean that ALL of a regenerate man’s affections are Godward. They are not. The regenerate man has Godward affections and also ungodly affections that arise out of the old man – the remaining sin nature that stays with us until our dying day. That’s certainly an ideal description of how a regenerate person OUGHT TO ACT, but it is not an accurate and necessary depiction of how regenerate men OFTEN DO ACT. “Love Christ and have no bones about it?” Well, regenerate Peter loved Christ and denied him thrice. “If scripture says something you do it?” Really? When God said, “Go to Nineveh!” - Jonah hopped the first ship to Tarshish. Time would not permit us to explore the innumerable examples of regenerate children of God who did not do as God told them to do. The bottom line is that the reality of remaining sin and the reality of the old man, as repeatedly taught to us in the bible, both reveal that Washer’s view of a regenerate man’s affections are hyperbolic and unscriptural. Here Conway provides anecdotal evidence of some regenerate people who changed dramatically. I do not doubt that this happens for some of God’s people, but the bible makes it certain that it does not happen for all of them, and insisting upon a few anecdotal examples to prove the broader case for regeneration doing this for ALL of God’s people is a classic composition fallacy. “Yeah, that Samson claims to have the spirit of God come upon him but look at him, hanging out with that Philistine whore against the clear command of God. Clearly he’s a false professor!” You see how when one applies this sort of logic to the saints of God found in the bible it proves incapable of refuting their state of grace. That should give us considerable pause when it comes to employing Conway’s no-truth-to-it test toward others in our daily lives. We should be clear that it is the Lord that trieth the hearts of men, and in so doing he sees things that we can never see through mere external observance. God’s word does NOT say that. In fact, it affirms that MANY who would fail Conway’s no-truth-to-it test will be in heaven nonetheless. Honestly there are few things more obnoxious than pharisaical Christians who believe they possess a god-like aperture on the hearts of men. It honestly makes me sick to my stomach. The Lord Jesus Christ’s harshest words were spoken to Pharisaical religionists who delighted in judging the eternal worthiness of others. God help us. Brother Conway, James is addressing regenerate Jewish Christians. He is affirming, even as we Primitive Baptists do, that they most certainly CAN fall into a state of spiritual adultery and love for the world. As a result of that possibility, he is admonishing them to resist such things, not in order to obtain the eternal life they already possess, but in order to walk in a manner worthy of their calling. The notion that James is addressing the unregenerate is shockingly removed from the context and intent of James’ epistle. Conway’s theology insists that regeneration is, at least in part, the result of telling those who are dead in trespasses and in sins that they are dead in trespasses and in sins, even though the bible says that such people are incapable of receiving spiritual truths such as this (I Corinthians 2:14). Well, Washer’s certainly right about that. American Christians are astonishingly ignorant of the fundamentals of the Christian faith. But this is no proxy for determining the number of regenerate people in this world. Very few marathoners finish the race in a couple of hours, most take four hours and still others take six hours. This does not negate that they were in the race but rather proves that they had greatly varying degrees of diligence and ability. I know some very dear Christian people who are not very familiar with their bibles but who love the brethren and enjoy worshiping God and hearing the word preached. I do not believe that their lack of academic commitment to the matter of studying the scriptures is an indication of their unregenerate state at all. The bottom line is that Washer’s observations have bearing on the quality of one’s discipleship and instruction in the truth, and do not, of necessity, have bearing on one’s regeneracy. Someone who is largely ignorant of the scriptures will likewise be ignorant of how they are to take up their cross and follow Christ in their lives in many ways. But again this has respect to one’s progress in discipleship, not necessarily to one’s regeneracy. Indeed, given the horrible state of teaching in most Christian churches today this deficiency is inevitable. Brother Conway, if what truly differentiates God’s people from those who end up in hell is “the life they lived” then salvation is indisputably by works and most certainly NOT by sovereign grace. So one must be very careful in how they handle such passages to avoid this crass assertion that undermines salvation by the sovereign grace of God. The actions of God’s people are evidences of their state of grace, nothing more. But Washer really jumps the shark with his hamfisted handling of Matthew 7:21-23. Let’s listen. But the “Lord, Lord” crowd is not living as though the Lord never gave them a law to obey. Rather, they are living as though their strict adherence to doing many good works is proof positive of their state of grace. Their behavior is much more in line with Lordship Salvation do-ism than with antinomianism. Notice the case they set forth for why they should be let into heaven. It makes no mention of the merits of Christ but rather appeals entirely to their own works as a basis for their righteous standing. No, these people were not antinomians who lived as though they had never been given a law to obey, they were religious zealots who thought so highly of their works that they believed those works could secure God’s eternal favor, irrespective of the work of Christ. Jesus is not saying that at all. He’s saying, “Your zealous, mighty, and even miraculous works cannot procure God’s favor.” He is pointing out the abject futility of works-based salvation and underscoring the teaching that, “This is the work of God, that ye believe on him whom he hath sent.” (John 6:29) THe Lord, Lord crowd’s appeal for acceptance is based entirely upon their own works and makes no mention of the merits of Christ whatsoever. It’s the futility of works-based religion that Christ has in view, not the suggestion that they needed to be more zealous, dedicated, and committed to doing good works. These people were not antinomian adherents of easy-believism. They were zealous religionists devoid of any conception of the merits of Christ. Washer’s seems to imply that had they done better: come to Christ more, seek him more, walk with him more, seek his counsel, follow his law more, treat him as king more they might have fared better. But this is just to double down on more of the same works that condemned them in the first place. Our salvation is not the result of or seeking, walking, law keeping, or any other thing that we do. It is based ENTIRELY upon the merits of Christ plus absolutely NOTHING else. Period. End of story. That people who promote “salvation by monergistic sovereign grace” do not understand this is nigh on incredible. I have often said that these former Arminian Baptists traded-in the easy-believism they were raised on for an acerbic-hard-believism and in so doing, missed the point once again – namely that salvation is based on the merits of Christ alone and not anything that we do, whether easy or hard. “So drop your easy-believism and become a hard-believist like me.” Oye. Why not preach the merits of Christ and teach that he did EVERYTHING required to fulfill the covenant for God’s chosen people. Well, I’m glad that Washer ended with a good affirmation. I completely agree with his assertion that “If you are going to walk with Jesus Christ, you are going to be opposed by everything in the world, and by the great majority of evangelicals.” That is no small part of why I am a Primitive Baptist who affirms that Jesus Christ did everything required to save his people from their sins and that I have absolutely no confidence in the flesh. 1. It sets forth an unscriptural and hyperbolic doctrine of regeneration. 2. It insists upon an ability to determine another’s state of grace. 3. It insists upon salvation by faith alone but also defines faith as including works. These errors all visit a great deal of vexation of spirit upon the flock of God and often result in a pharisaical and judgmental spirit among the Lord’s sheep. We should all commit to the Lord and endeavor to mortify sin in our lives, but we must do that without losing sight of the fact our performance in righteousness does nothing to merit God’s favor and that we are saved based entirely upon the merits of Christ alone, in spite of our poor performance in righteousness. That is the gospel truth and it is the only way any of God’s people are ever saved. Christian (n.) - a biblical term applied to those who were disciples of Christ at Antioch (Acts 11:26). These were regenerate men, who had heard and believed the gospel, who had brought forth the answer of a good conscience in the waters of Baptism, and who were members of the Lord's NT church. Regenerate Man (adj./n.) - depicts a man who has been born of the spirit of God via the new birth, which is a sovereign act of God alone wherein eternal life that imparts eternal life to one who was dead in trespassess and in sins. All proper Christians are regenerate, but not all regenerate men are Christians. The OT saints were not proper "Christians" as they never were baptised nor did they join the Lord's NT church under a profession of faith in the finished work of Jesus Christ's death, burial, and resurrection. It is important to be clear about the definitions of these two terms and the distinctions that exist between them. The common practice of using them interchangeably is prone to breeding inaccuracy and misunderstanding. Thanks for this article. Paul Washer and Tim Conway are both pretty wrong in their (not God's) definition of regeneration and salvation. They make salvation about works while at the same time claiming it's by grace through faith. They tell you it's about you, and not what Jesus did for you. Their teachings really hurt my walk with God and I'm sure have hurt many others. Read the Word and let God speak, not men. God bless you. UNKNOWN: Thanks for this article. TETH: Glad you liked it. UNKNOWN: Paul Washer and Tim Conway are both pretty wrong in their (not God's) definition of regeneration and salvation. TETH: Yes. I completely agree. Their view of the regenerate state cannot be reconciled at all with the man of Romans 7 nor of many of the saints of God in the bible such as Lot, Samson, Solomon, etc. UNKNOWN: They make salvation about works while at the same time claiming it's by grace through faith. TETH: That is precisely correct. They proclaim "Grace! Grace!" when there is no grace in their system, once you look at how they embed works into the matter. UNKNOWN: They tell you it's about you, and not what Jesus did for you. TETH: True. If you're not towing the line or "totally committed" then Jesus's work didn't get ANYTHING accomplished. It's really nonsense of the highest order and any simple reading of Paul in Romans 7 will prove their claims about the regenerate state to be completely false, IMO. That's probably why Conway insists that the man of Romans 7 is unregenerate - which is a completely untenable assertion. He must make this claim, however, if he is to remain logically consistent with his claims about what is means to be regenerate, because if the man of Romans 7 is regenerate, his assertions come crashing down in a major, major way. UNKNOWN: Their teachings really hurt my walk with God and I'm sure have hurt many others. TETH: Yes. I have witnessed this hurt among many others as well. Their Lordship Salvation doctrine is a very damaging form of NeoPharisaism. When you see it at work in a church body it's like being surrounded by the zealous secret police who are ever on the lookout for some slip-up so they can declare another false convert. Pretty ugly stuff. UNKNOWN: Read the Word and let God speak, not men. God bless you. TETH: God bless you as well. Revelation3:22 He that hath an ear, let him hear what the Spirit saith unto the churches.3:21 To him that overcometh will I grant to sit with me in my throne, even as I also overcame, and am set down with my Father in his throne. God's people overcome "by the blood of the Lamb" and "the word of their testimony" is an affirmation of THAT truth. A proper understanding of THAT critical truth dispels the myth that one's personal performance in righteousness has anything to do with one's eternal salvation. I hear the testimony of the one eternal over-comer, the Lord Jesus Christ, whose love we cannot be separated from(Romans 8:31-39). That said, is there some particular statement in my analysis with which you take issue? I would be happy to examine it if you will bring it to my attention rather than launching vague, broadside implications against my beliefs.